Ingredients: Ground corn, Soybean meal, Ground wheat,Vegetable oil, Wheat germ meal, Sucrose, Dicalcium phosphate, Calcium carbonate, Ground fruit (bananas, oranges, apples and grapes), Iodized salt, DL-methionine, Choline chloride, Ascorbic acid (source of Vitamin C), Natural mixed tocopherols, Rosemary extract, Citric acid, Natural and artificial colors, Artificial flavors, Manganous oxide, Zinc oxide, Copper sulfate, Calcium iodate, Sodium selenite,Vitamin A supplement,Vitamin D3 supplement, Vitamin E supplement,Vitamin K supplement, Niacin, Calcium pantothenate, Pyridoxine hydrochloride,Thiamine, Riboflavin, Folic acid, Biotin,Vitamin B12 supplement. 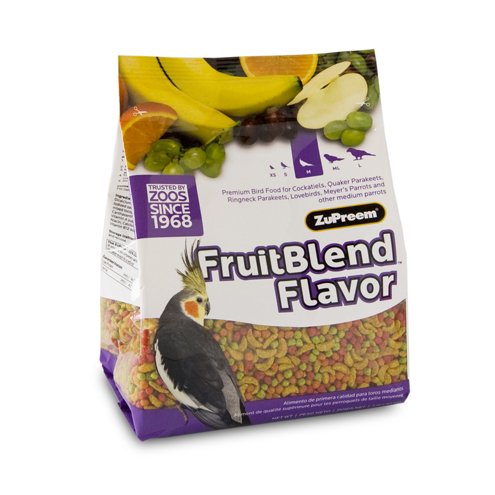 Zupreem FruitBlend Large Parrot 3.5lbs. 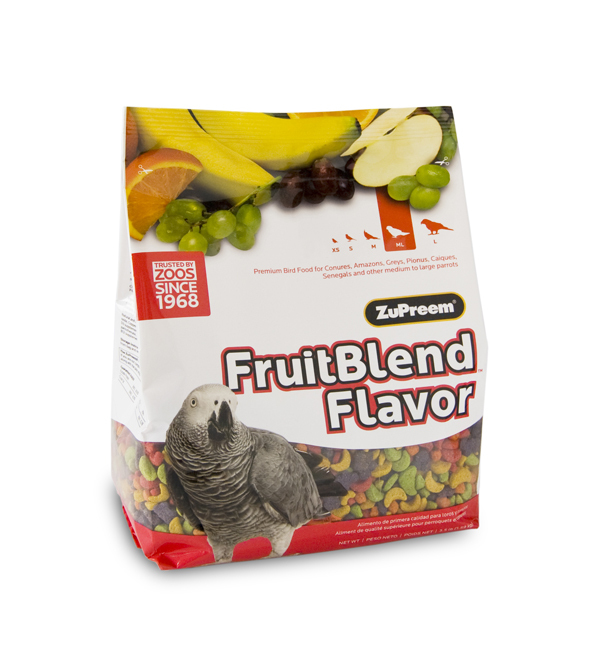 Zupreem FruitBlend Large Parrot 12lbs. Ingredients:Ground corn, Soybean meal, Ground wheat, Wheat germ meal, Sugar, Vegetable oil (preserved with mixed tocopherols), Ground millet, Ground oat groats, Ground barley, Calcium carbonate, Dicalcium phosphate, Iodized salt, DL-Methionine, Ground ßaxseed, Caramel (color), ArtiÞcial mixed nut ßavor, Cho- line chloride, L-Lysine, Vitamins (Vitamin E supplement, Niacin, Calcium pantothenate, Pyridoxine hydrochloride, Vitamin A supplement, Biotin, Riboßavin, Thiamine mono- nitrate, Menadione sodium bisulÞte complex (source of Vitamin K activity), Vitamin B12 supplement, Folic acid, Vitamin D3 supplement), preserved with Mixed tocopherols and Citric acid, Dried carrots, Dried celery, Dried beets, Dried parsley, Dried lettuce, Dried watercress, Dried spinach, Dried cranberries, Dried blueberries, L-ascorbyl-2-polyphosphate (a source of vitamin C), Hydrolyzed yeast, Minerals (Manganous oxide, Zinc oxide, Copper sulfate, Sodium selenite, Calcium iodate), Rosemary extract. Ingredients:Ground corn, Soybean meal, Ground wheat, Wheat germ meal, Sugar, Vegetable Oil (preserved with mixed tocopherols), Calcium carbonate, Dicalcium phosphate, Dried carrots, Dried peas, Dried celery, Dried beets, Dried parsley, Dried lettuce, Dried green beans, Dried watercress, Dried spinach, Iodized salt, DL-Methionine, ArtiÞcial colors, ArtiÞcial ßavor, Choline chloride, L-Lysine, Vitamins (Vitamin E supplement, Niacin, Calcium pantothenate, Pyridoxinehydrochloride , Vitamin A supplement, Biotin , Riboßavin, Thiamine mononitrate, Menadione sodium bisulÞte complex (source of Vitamin K activity), Vitamin B12 supplement, Folic acid, Vitamin D3 supplement), preserved with Mixed tocopherols and Citric acid, L-ascorbyl-2-polyphosphate (a source of vitamin C), Minerals (Manganous oxide, Zinc oxide, Copper sulfate, Sodium selenite, Calcium iodate), Rosemary extract. 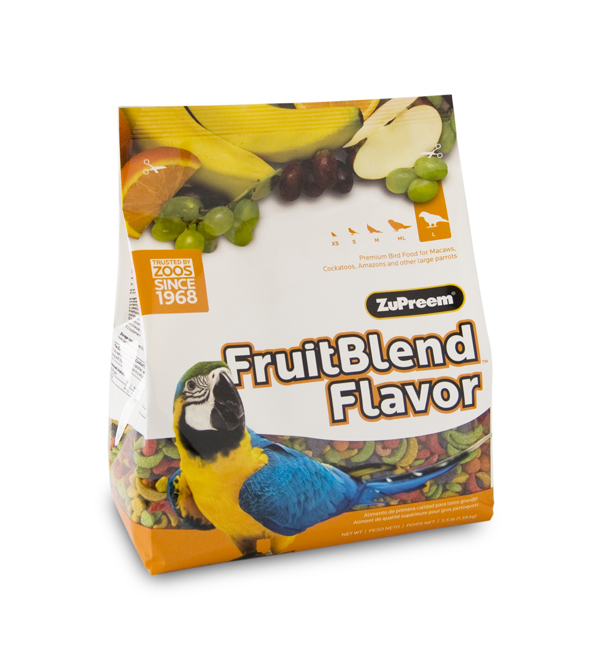 Zupreem Large Parrot Natural 3lbs. Zupreem Large Parrot Natural 20lbs.